This is the most popular and biggest fair in Prague, which takes places every year in Holešovice in Prague 7 and is the first spring fair in Europe. St Matthew's Fair, known in Czech as Matějská pouť is extremely popular among the locals and have become a long standing Czech tradition. St. Matthews is the patron saint of construction and confectioners. Apparently, the earliest festival began more than 416 years ago, and although times have changed, the rides have only got better and crazier. There are about 120 attractions on the exhibition grounds, including roller coasters, houses of horror, carousels, waterfalls, virtual reality machines, cannonballs, a water world and a ferris wheel. Some attraction, like the bouncy castles and the Jungle King House don’t have a time limit, so your kids can have as much fun as they like. To get to the Giganti exhibit - the show with the realistic looking animals - you need to enter the fairground, and it costs a separate entrance fee. The exhibit is accompanied by information written in both Czech and English. For an authentic Czech experience let your kids try out little boat swings. 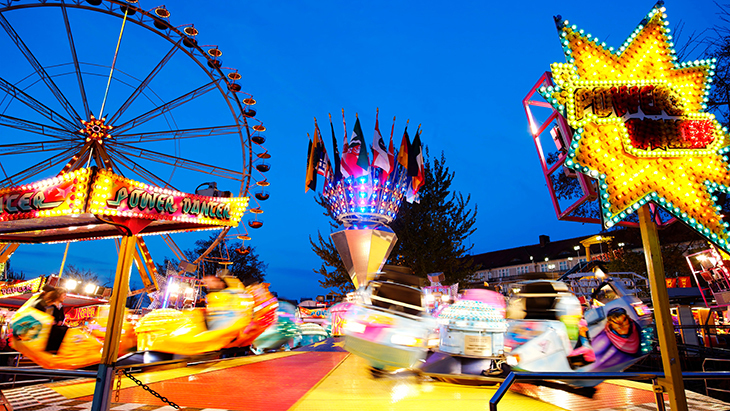 Even though St Matthew's Fair is mainly a place where children can enjoy carousels, roller coasters and other games, there is lots of fun for adults and parents - there is a wide range of adrenaline-pumping attractions dedicated especially to them. Some attractions are age-restricted for safety reasons. Another highlight is the mirror maze set up in such a way that you really might get lost. For the threat of being pickpocketed, it is advisable to pay attention to your belongings. As to the prices, on weekends, adults pay 25 CZK, children are free. Rides for little kids cost 30 - 50 CZK per go. Unfortunately, there is no all-day pass available. Entrance to the Giganti exhibit costs 350 CZK for a family with a maximum 3 kids, including entrance to the mirror maze. Opening hours: Tue - Fri 14.00 – 21.00 Sat - Sun and public holidays 10.00 – 22.00. The fair runs from March 5th - April 25th.